Noon until 10:00 p.m., rain or shine. FREE!!! Frontier Park, West 8th St. and Bayfront Pkwy. Two days of great music in the summer air. Bring your blankets or lawn chairs for the family, plus sunscreen, and settle in for the show. Different bands every two hours, starting with a child-friendly show at noon. Vendors are available so you can purchase food and drinks to keep you comfortable for the afternoon and evening. We are indebted to Cory Vaillancourt's release in this week's ERIE READER for much of the information following about lineups and personnel. 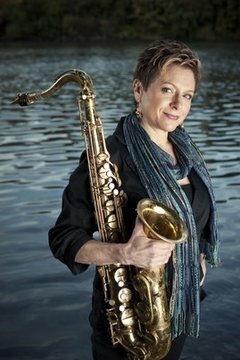 Noon -- Susan Goodman, award-winning children's author and entertainer, jazz saxophonist. Goodman has released five albums for children, most recently "Live Out Loud" (CD Babym 2012) which has a theme focussed on bullying. 2:00 p.m. -- Ron Yarosz and the Vehicle. Fresh from his appearance at JazzErie's Jazz Walk, Ron Yarosz, organ player (both harmonica and B-3), vocalist and composer, brings an all-star group. Eric Brewer, Ralph Reitlinger and Ron Sutton do the honors as sidemen. 4:00 p.m. -- The Breeze Band. One of the freshest, funkiest local R&B groups, the band is composed of Barry King, Maurice Troop, Kenny Hollis, Kevin Sapper and Rahman Hicks. 6:00 p.m. -- Corey Harris and the Rasta Blues Experience. Acoustic revivalist Harris has performed worldwide, appeared in a Martin Scorsese film, and gained growing recognition as a searcher for blues truths. Harris will also appear in a "Meet the Artist" session at 3:30 p.m. in the gazebo near the west side of the park. 8:00 p.m. -- Kenny Neal. 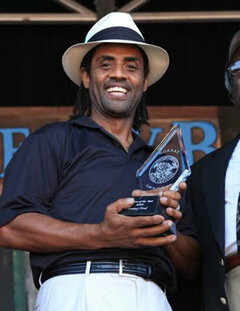 A Louisiana-born blues man, singer and multi-instrumentalist, Kenny Neal learned his art from his father, Louisiana bluesman and harmonica legend Raful Neal. His website describes him as a "swamp blues master." Say no more! Noon -- Parade Street Dixieland Band. A local creation assembled by inveterate Dixie enthusiast and tenor banjo player Harry Aldrich, this assembly of talented musicians brings a traditional flavor to the opening of the Festival's jazz programs. 2:00 p.m. -- Lydia Marks. A singer with great class, presence and musicality, Lydia has lived in the Erie area for some years now, following high quality tenure in Las Vegas clubs and elsewhere. Elsewhere, in Lydia's case, includes the Apollo and the Red Blazer Jazz Club, both in New York City. Lydia will bring a musically astute corps of area sidemen: Allen Zurcher - saxophone, Harry Jacobson - bass, Howard Hamme - piano and John Bacon - drums. 4:00 p.m. -- Cats A Bear. This elite group of regional musicians has been heard not enough in recent months, but continues to develop new material and maintain a consistently high level of performance. Guitarist Frank Singer and drummer/voccalist Joe Dorris are the kingpins, joined by bassist Joe Frisina, percussionist Nick "Tito" Ronzitti, and saxophonist Phil Papotnik. 6:00 p.m. -- Tony Grey trio. If you've followed jazz in Erie in recent years, you've heard this phenominal, lyrical six-string bassist who settled with his family in the area but brings a solid world-wide reputation. Contemporary, wise, fusion-oriented, inspired by uncle-mentor John McLaughlin, Grey has his own take on the music, and noone sounds quite like him. The following video, with his trio, gives a sample. 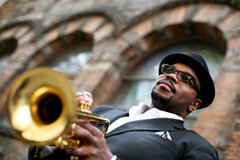 8:00 p.m. -- Jeremy Pelt Quintet. Pelt is riding high these days as a member of the very small, highest echelon of jazz trumpeters. He visited Erie a few years ago as a rising star. Well, now his star has risen! Check out Pelt and his quintet, though with an altered lineup, on the following video. The performance was in Paris. Saxophonist was Roxy Coss, the drummer Johnathan Barber.. The tune: "We'll Be Together Again." We expect Pelt's regular Quintet personnel: J.D. Allen - tenor sax, Danny Grissett - piano, Dwayne Birno - bass, Gerald Cleaver - drums.